Leaders who have been trained in the command-and-control mode of management are realizing that while it may work effectively in some circumstances, it often fails to truly engage people. In response, management thinkers have proclaimed the end of command-and control and the advent of a new, participatory model. 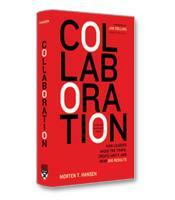 This book offers a systematic understanding of As One collaborative behaviors and bridges the gap between theory and practical advice illustrated with insightful case examples. Which Archeype Drives Your Team? 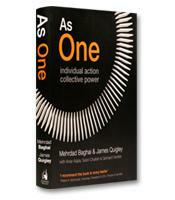 In As One: Individual Action, Collective Power, consultant Mehrdad Baghai and Deloitte Touche CEO James Quigley present an insightful and innovative framework for working "as one" — their phrase for collaborative leadership and behavior in which a leader is able to get "a cohesive group of people working together effectively toward a common goal or purpose." 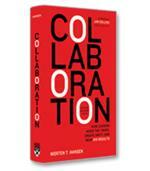 The framework — based on a major Deloitte project — is built around eight archetypes of collective behavior, each labeled by leader and followers. Landlord and Tenants. The landlord archetype is the traditional top-down control leader who controls access to resources. Landlords set the terms for the followers, the tenants, who voluntarily join the landlords because it’s in their best interests to do so. The Apple App store is an example of this archetype. Apple (the landlord) controls the App Store, which is populated by apps created by developers (the tenants). Community Organizer and Volunteers. The community organizer and volunteers are the mirror image of the landlord and tenants. Most of the power is vested in the autonomous followers (the volunteers), while the community organizer "ignites volunteers’ interest through compelling storytelling and opportunities for volunteers to join." The Linux operating system phenomenon is an example of this archetype. Conductor and Orchestra. In this archetype, everyone has specifically scripted roles defined by the conductor. Mail-order pharmacy Medco, with its 1,000 specialist pharmacists in its Medco Therapeutic Resource Centers, is an example. Producer and Creative Team. Producers offer their creative team the freedom and the most conducive environment to do their best work. The Cirque du Soleil’s creative process is an example of this archetype. General and Soldiers. This archetype features command-and-control leadership and scripted work for committed followers. Marriott has a career-advancement process for its entry-level hospitality works that reflects the General and Soldiers archetype. Architect and Builders. In this archetype, creative, collaborative builders are recruited by visionary architects to bring innovative and ambitious dreams to life. The development of the world’s cheapest car, the Tata Nano, is an example of this archetype at work. Captain and Sports Team. This archetype of collective behavior features minimal hierarchy, and the strong camaraderie and trust of a sports team. Each person has his or her job. The highly complex process of the dabbawalas — the 5,000 closely-knit, mostly illiterate lunchbox men, who deliver 200,000 hot meals to the downtown offices buildings of Mumbai, India — is a startling example of the power of this archetype. Senator and Citizens. This archetype features a shared commitment to the values of the community. Citizens are autonomous, although senators are "the guiding intelligence for the citizens and oversee decision making for the community," according to the authors. W.L. Gore’s innovative organizational structure — which features no formal titles — is an example. The authors dedicate a chapter to each archetype. Each chapter contains the same elements: an "inspirational story" illustrating the archetypes; an in-depth business case study; a detailed description of the archetype’s six key characteristics; and an applicability section. The six characteristics of the Producer and Creative Team archetype, to take one example, are: 1) Producers articulate an overall objective, the creative team brings it to life; 2) Members are recruited because of their skills and how they complement the rest of the team; 3) The creative team has complete freedom to express ideas; 4) Success is measured by the ability to innovate and to match the objective; 5) Dissent is used to push the creative boundaries of the team; and 6) The creative team collaborates closely. Supremely organized and filled with real-life, compelling examples, As One offers a thought-provoking framework for thinking about leadership in today’s highly diverse and situational world.